So, at the third time of asking we got a game of FA Cup third round football at the Valley. Ahoy! Ahoy! and all that. And this time Mark, Johnny and I got into Crossbars with the tickets we’d been slipped by Mr Murphy the Charlton fan. I then downed a couple of pints of Murphy’s (the stout, not the beer belonging to the other Paul). Crossbars is like a giant Exec box set in their North Stand with a tremendous view towards the away end. From there the playing surface did not look great and as soon as the game started the proof was indeed in the pudding of a pitch. Extensive rolling had smoothed away the bobbles but no dead cat bounce theory could be proven here. The misery of three consecutive home games had blinded me to what a useful away side we are and going in to this one I thought the outcome likely to be a Charlton win (85%), draw (10%) and, well you can work the rest out. Plus they had destroyed us early in the season. When I saw the line up I had no reason to change this assessment and initially thought Chris Wilder isn’t going for this, he’s not put out the strongest team available. No Danny Rose, no Dave Kitson, no Ryan Williams and no Deane Smalley. (Despite my recent views on Deano I would have started with him over Tyrone Marsh, although I know loads will disagree). Then I thought, wait a minute, we’ve got some strength on the bench here and that can only be a good thing. And when the game started I soon thought, hey, we look solid and well organised and are at least the equal of our Championship opponents. What we got was a very enjoyable game of football (although Charlton fans will probably strongly disagree), another good whole-hearted away performance with players who have recently been off form showing much better what they can do. And all this for just a tenner. Overall a draw was a fair outcome. There’s no denying that we deserved a lead at the break or that Charlton significantly improved in the second period. For a Championship side Charlton were quite bad before their half time re-grouping and no doubt bollocking from Chris Powell. They’d passed the ball about a bit to no effect, contrived to gift us throw ins by playing simple passes into touch when under no pressure or by showing an ability to miscontrol the football and had been no more threat than your average League One outfit. Additionally, unlike us they didn’t look sound at the back and we took full advantage. We had Jake Wright and Michael Raynes reading and anticipating things perfectly, with Wrighty bringing the ball out and Raynesy clearing as centre halves of his ilk tend to do. The full backs were solid too as was our whole set up. Charlton had nothing similar and it didn’t take us long to go one up. Scott Davies had ample time to get a ball in from the right and the effort from Johnny Mullins may have taken a deflection off someone but that’s the reward for attacking. The same goes for number two. Mullins was involved again, winning the ball from a Charlton dawdler and finding Beano who played a perfect ball into Davies’s path. The defence weren’t doing any kind of marking job but it was still a joy to see a midfielder getting forward and exploiting the space on offer. It was a very good finish although on the night I thought he’d screwed it wide. Replays showed the biggest risk was loss of balance. On this occasion Mullins did a much better midfield job than we’d seen previously. (These things take time). I’d only seen glimpses of a half decent player in Davies before this showing but here we had a player worthy of being regularly considered for a starting spot. And we mustn’t forget Josh Ruffels. “Josh never gives the ball away”, said Mark, and he was right. It was a quietly effective performance from the only one of our youngsters who is genuinely on the verge. Sean Rigg and Beano were much better than they had been recently and the only player, including the subs, who disappointed me, was Marsh. Sorry and all that but I just can’t see that he’s got it for this level. I understand he needs game time to get experience and get better and I really want him to succeed but at the moment I’m thinking no better than Conference North or South. It goes without saying that I’d love to be proven wrong. That we were unable to prevent a more purposeful home side from clawing back the deficit means we’ve got another home game to look forward to / endure (take your pick). Michael Morrison’s towering header at the near post, when Beano didn’t have it in him to as much as put the guy off, got them back in it very quickly but our heads never dropped. And the same can be said when the equaliser went in with eight minutes of the 90 to go. By then we were starting to look a bit more tired and the sharpness was going. Tom Newey was easily done by the winger who delivered the cross from which Yan Kermorgant somehow got his spectacular effort into the net. We had plenty of defenders in the box and there was possibly a slight case of after you between Raynes and Wright as the ball passed by them. Still we didn’t panic and other than one wonderful saving header from Dave Hunt we came through those final minutes, including the 5 added, when we had a tiny glimpse of victory ourselves. 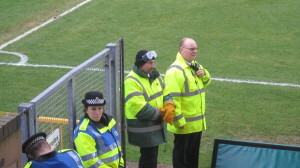 Is this steward about to fly a first world war plane or get his welding gear out? When they came to the Kassam we knew what a dirty horrible team Wycombe have become under Gareth Ainsworth and they were just the same again on Saturday. The sooner he goes the better for football but if the Chairboys persist with him then I’d hope to be able to wave them goodbye as they drop into the Conference. They’re only two points above the relegation zone albeit with a game in hand. And for Wycombe fans to think they’re hard done by beggars belief. This is the lot who big it up as a local derby, think we’re the noisy neighbours yet can’t even crack the 4k mark meaning that we provided nearly a third of the gate. I noticed lots of little sneaky pushes going on and whilst we weren’t innocent in this regard we were not indulging in such behaviour as frequently as our opponents. It doesn’t take much to illegally knock a player off balance as he is trying to get a clearance away or shot on goal. Referees rarely seem to pick this up and sadly it’s now an accepted part of proceedings. I know it’s a man’s game (except when the women are playing of course) and I love a good fair thundering tackle but I want skill to win over brutality and cheating. Which brings me on to the number of times one of our guys was cynically taken out way off the ball as he tried to make a run. With the referee and his assistants looking at the ball this was of course never picked up. Johnny Mullins wasn’t assaulted once but twice. After the first it required a bit of basic counting of the physio’s fingers to determine that he had come round enough to continue. 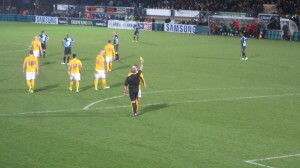 No punishment was dished out to his assailant but the referee had no hesitation in showing a red card the second time. The home fans didn’t like it and even less so as a recovered Johnny strode to the touch line with chest puffed well out to await his recall to the action. Right, I’ll now do a bit of honest revision – Having seen the sending off again on the FL Show, I’m not so sure. There was definitely an arm in the face. It may have been deliberate or it may have been a complete accident with Steven Craig only being fully focused on the ball. The referee was of course a lot closer than any fan, although we all know what referees are like. The truth is that I’m biased, Oxford fans are biased and Wycombe fans are biased as are all fans. Some of us like to think we’re being fair and objective but we can’t be can we, if we’ve got our team colours running through our veins? So how did we cope against ten men for 70 plus minutes? In the first half our tactic seemed to be pass, pass and pass in order to get the home side to chase, chase and chase with the objective being to tire them out. I noted a sense of frustration amongst some of our fans that we weren’t creating a bucket load of chances. But then just before the break after a multi – pass move Beano had a header that required a full stretch from Matt Ingram to keep it out. Other than another Beano effort early on I can’t remember many other first half chances. In the second period we remained patient and had a few chances, the two most noticeable fell to Beano and Williams who hit shots just over the bar in similar fashion after being set up with balls pulled back from the right that fell just behind them instead of dropping ready for the perfect strike on goal. But we hadn’t scored as the game entered the final few minutes. I heard a comment that we were too negative. I didn’t understand that at all. We’d taken the faultless Michael Raynes off at half-time and brought Deane Smalley on to play alongside Beano. So that’s two up front with two wide men. I’d hardly call that negative. My mate Mark thought we should have put a third man in central midfield and I must admit I was worried that a breakaway would undo us, particularly after Joe Kuffour entered the fray. (Thankfully Dean Morgan was still out injured). At no stage did we panic and hit aimless balls into the box for Gary Doherty to win in the air and eventually our patience paid off. Ryan Williams did well down the right as he had done umpteen times. His cross was played back by Beano into the path of Nicky Wroe who hit the perfect half volley. 1-0. Points were ours. Bloody referees – Wroe gets booked for celebrating his goal. Even when we do well away (and boy haven’t we done well) there are still those who focus on our crap home form. I’ve had enough of that when we’ve actually been at home so when we’re away I will bask in the glory available thank you very much. Tells me that unless the teams at the top crack up or those below come with a really good run – which one or two may well do – it should be 7 from 8 for the automatic and play-off spots. It’s slightly disappointing to still only be 7th after this win but the team in 9th are 5 points behind us having played two games more and the teams in 10th and 11th position are three points further back although having played only one game more than us. After an away game I am going to allow myself to believe but will reserve the right to completely change my opinion after our next home league game. This entry was posted on Monday, January 20th, 2014 at 4:17 pm and appears under 2013, Comment. Both comments and pings are currently closed.